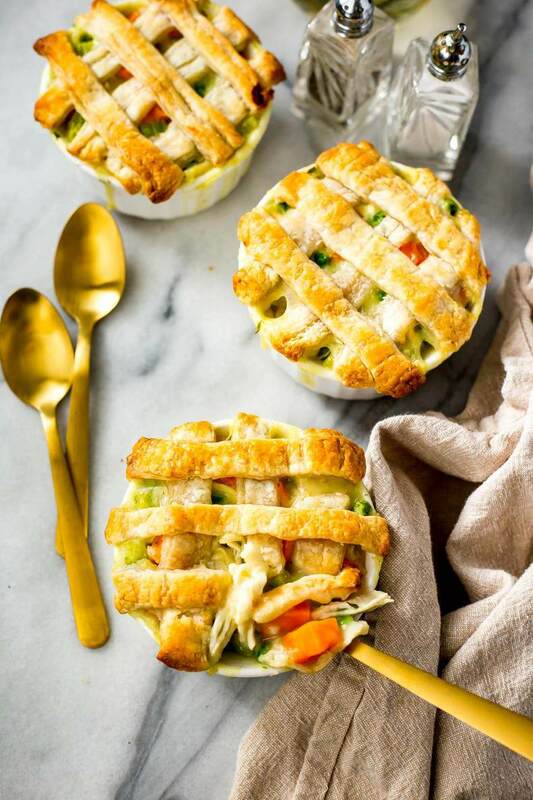 Okay, first of all HOW CUTE ARE THESE MINI CHICKEN POT PIES?! I think I'm going to start making EVERYTHING in individual serving sizes in the name of cuteness. Not even just for the whole portion control thing. No. For CUTENESS. There is a method to my madness though, I promise. I've taken your favourite comfort food, most likely made with love by your mom, gramma, aunt or whoever's the good cook in the fam, and made it a teensy bit healthier, and the perfect serving size for dinner. 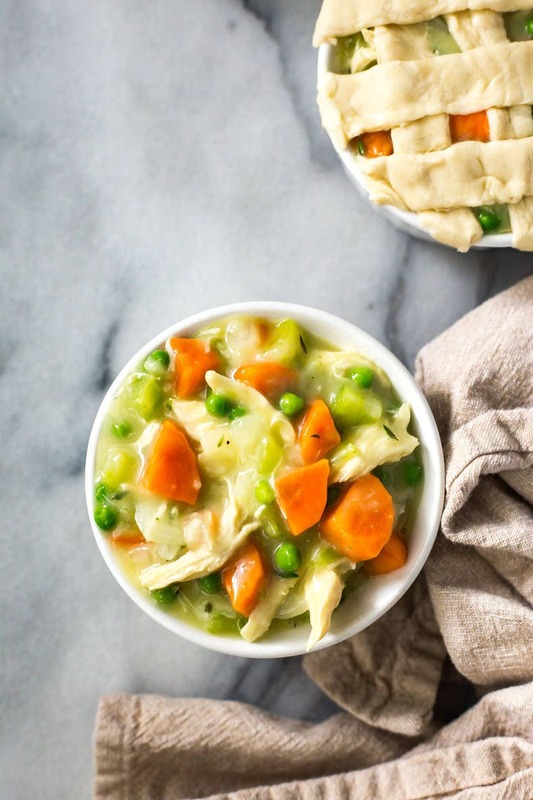 These Mini Chicken Pot Pies are freezer-friendly, so you can take them out and heat them up in the oven after a long day, and they're also made easier thanks to a bit of puff pastry. Honestly, puff pastry is my new cooking shortcut discovery of the year you might say. It's SO easy to cook with (literally just roll out, cut into whatever shape you want and bake), and it's a relatively simple ingredient without a ton of additives. Of course anything store bought is not going to be as good for you as something you can make from scratch, but I think it's safe to say that in the crazy busy world we live in today, it's not always possible to make your own crushed tomatoes or homemade stock or homemade pie dough, etc. You can, don't get me wrong. And if that's important to you, I always say that you should follow your heart and your own food philosophy. There's a ton of food you can make from scratch (even your own condiments like ketchup) and if you do things in batches or you don't use these ingredients a ton so you can make them last, it can be a great way to add more nourishing ingredients to your everyday life, with reduced additives, sugars and sodium. But as for me? I welcome shortcuts where I can take them. I already feel like I make the effort to eat very healthy, getting lots of lean protein, leafy greens and a variety of fruits and vegetables, and I don't have the biggest sweet tooth ever either so consuming sugar isn't a huge concern of mine. Don't get me wrong, I indulge every now and then but I feel like I already eat in such a way that I'm limiting the amount of processed food I'm consuming so to take shortcuts with different ingredients in the bigger picture of a meal just isn't a big deal to me. Anyway, back to what I was saying about shortcuts before I dove into my whole thing on healthy eating LOL. I've been working more with different food brands (doing photography for their websites and social media feeds outside my blog), my cooking skills have been put to the test more than once. 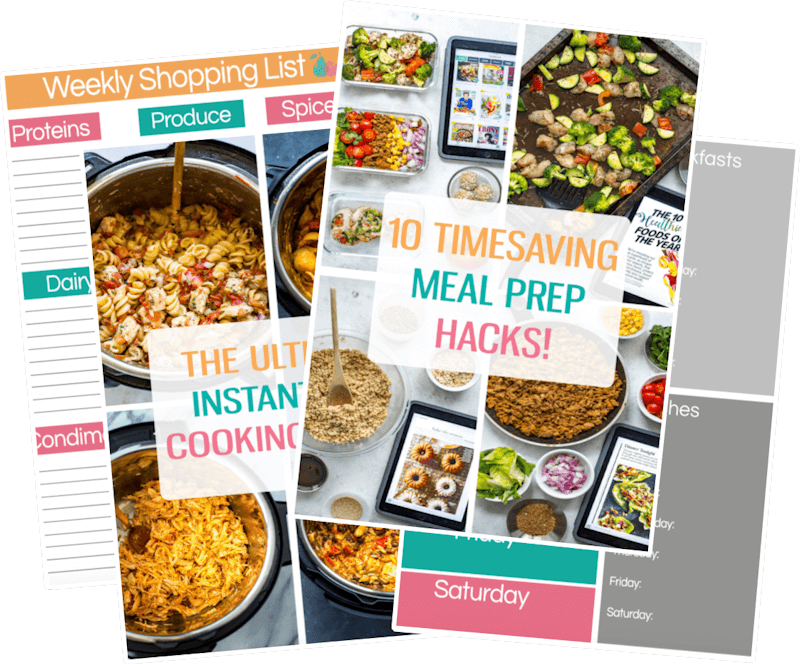 I feel like I've learned SO much more about food this year just in terms of how to style it and what shortcuts you can take to whip up tasty creations in an easier way. I'm all about efficiency, whether that's in your work or personal life. 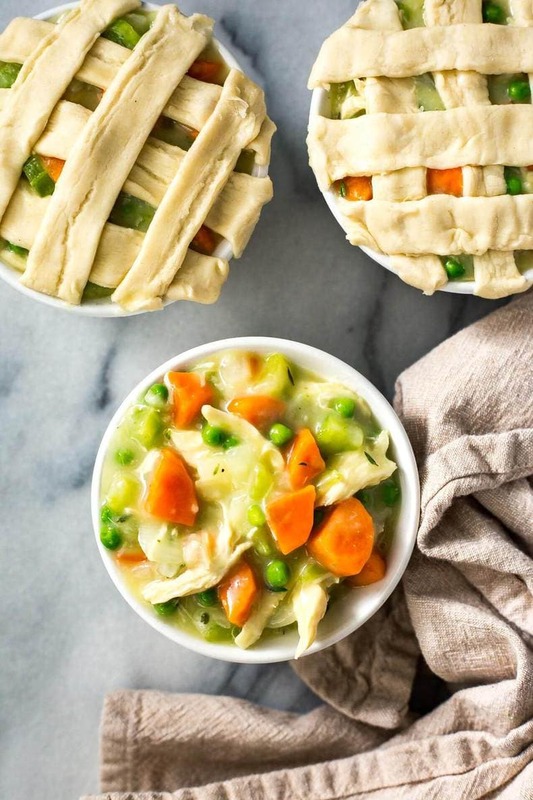 So something as simple as puff pastry or pre-made pie dough really makes these Mini Chicken Pot Pies come together in no time, and a little goes a long way. I only used one sheet (a box usually comes with two sheets) and then cut the sheet into 1-inch thick slices with a pizza cutter, then placed them over my ramekins. 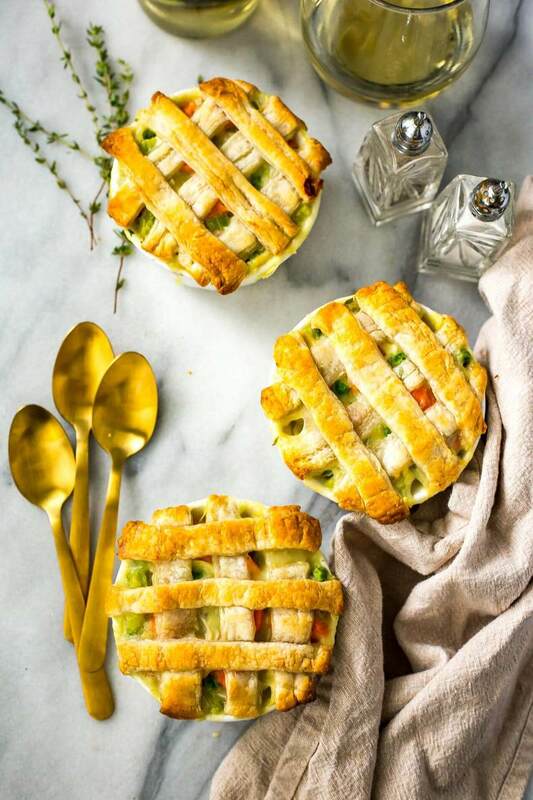 So much easier than making an actual pie, and the criss cross weave over the top just oozes fall comfort food. One of my favourite things about this time of year is giving yourself a break from the hectic-ness of life at night. 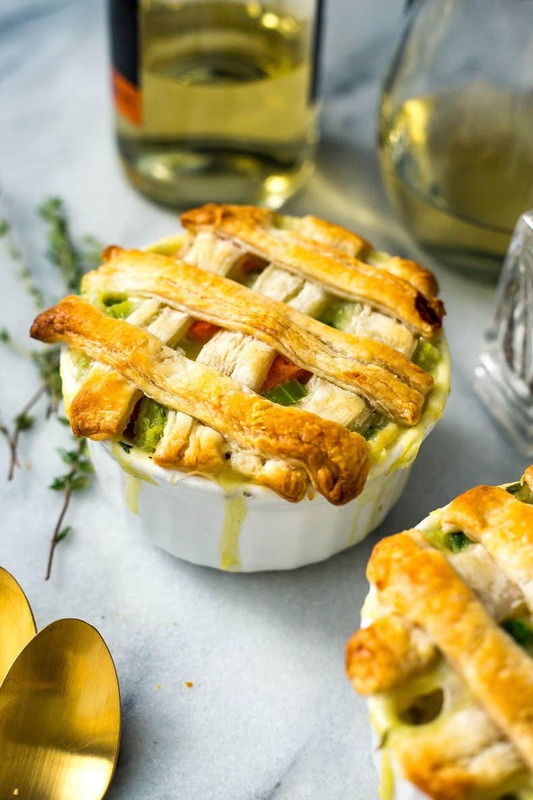 There's nothing better than pulling out a little Mini Chicken Pot Pie out of the freezer and kicking back with some of your favourite shows. Back when I lived at home that was actually my favourite kind of night; the night my mom didn't feel like cooking and she announced to the whole house that we were eating out of the freezer. Now before you raise your eyebrows and tell me I'm crazy, just hold on a second. 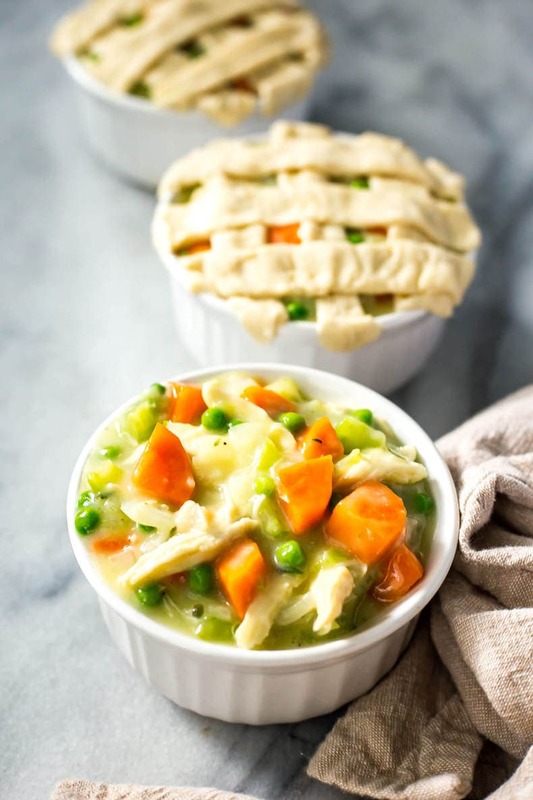 My mom buys these delicious Indian-inspired chicken pot pies that are a specialty item from our local farmer's market, and they are individual serving-sized savoury pies that are SO GOOD. I love the feeling of being cozy at home, pulling something delicious like this out of the freezer and then relaxing while the warm smells from the oven fill the house with an amazing aroma. There's something so homey and amazing about it and it literally makes me look forward to cold, dreary days in November when we finally have an excuse to stay inside. 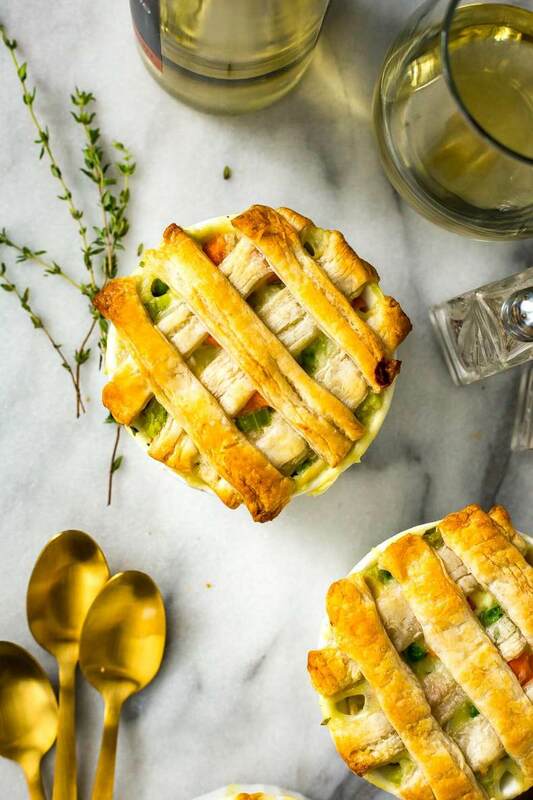 Will you be making these Super Easy Mini Chicken Pot Pies? Can't you just see yourself with one of these after a long day, lots of candles and blankets, all snuggled inside with a glass of wine watching your fave shows? Yep, I might already be there. Bring on hibernation season!!! 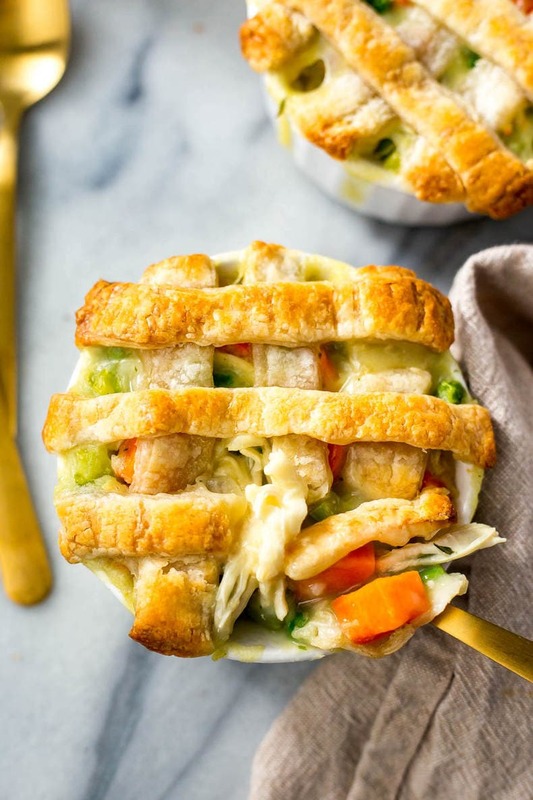 These Super Easy Mini Chicken Pot Pies are a healthier, lighter version of your favourite comfort food made with puff pastry in the perfect individual serving size! Cook chicken in boiling water for 15-20 minutes until fully cooked and shred once cooled. 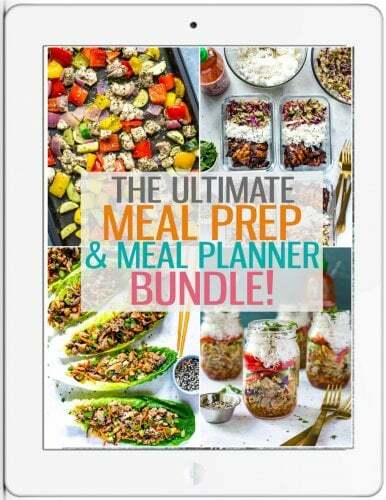 I usually do this step a couple days ahead of time during my weekly meal prep or use leftover/rotisserie chicken for this recipe. Preheat oven to 400 F. In a large skillet, heat olive oil over med-high heat. Add onions, garlic, celery, carrots, salt and pepper, sauteing for 4-5 minutes until softened. Add flour and mix well. Add chicken broth, bringing to a boil and letting mixture thicken. Stir in chicken and peas, then remove from heat. Divide chicken mixture evenly among 3-4 medium-sized ramekins (I use the Coringware kind). Roll out puff pastry and cut into thin 1/2-inch thick slices with a pizza cutter. Take slices and add to ramekins in a criss-cross fashion. Place ramekins on a baking sheet and bake in the oven for 20 minutes until puff pastry is golden brown. Remove from oven, serve and enjoy! Great comfort food recipe! I love your website; it gives me great ideas. I would personally cut down on the flour a little, as I find the sauce will thicken as well while baking them. But it’s all a question of taste, isn’t it? Keep up the excellent work, looking forward to your next recipe! Yes these are definitely adorable! How would you recommend freezing and then reheating these? Thanks! Hey Debbie! I would recommend freezing in the Corningware containers themselves or using mini foil containers! Reheat at 375F for 45 minutes or so!